My poor blog often gets neglected in favour of Facebook, and a lot of what I post there is obviously missed by my readers here. If I have any left. So I would like to present a small collection of the things my children have said and done over the past months for your entertainment! Ellie’s teacher tells me that Ellie’s work and improvements often get used as examples for the rest of the class. She’s getting level 16 readers sent home now. Me: You’ll have to get up soon so we can go get Ellie from school. Ellie’s been learning about symmetry at school; she asked me this morning if her bottom was symmetrical. Elspeth hit Evelyn with a bangle, breaking the bangle, and now she’s having conniptions because I said I won’t buy her a new one. The girls are playing shop, and their economy is totally screwed. Ellie charged Evie “twenty hundred dollars” for a little foam sticker, and then “a single hair” for a wooden building block. Evie: If I step in coffee I will get coffee on my shoes and then daddy will have to drink my shoes and that will be funny. Playing doctors with Evie, and she assures me that there is a lion living in my throat and that’s why my leg is sore. Ellie saw me taking my anti-depressant this morning and asked me what it was for. I told her it was medicine to stop me being sad and cranky, so she started pouting and stomping her foot and saying she needed some too! Evie: My finger hurts when I touch people. Me: So don’t touch people. Evie: But I have hands. I read Ellie the little bit from the Hitch Hiker’s Guide to the Galaxy about how to fly. Now she’s jumping off the couch trying to miss the floor. 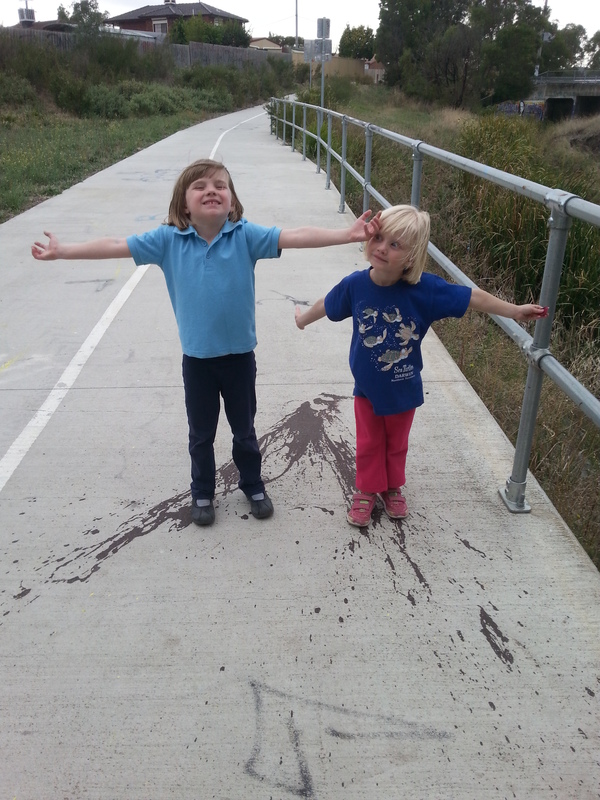 Evie: I did two poos! Not four or three, or five or eighteen. The girls have started calling themselves Science Princesses. I have no idea exactly what that means, but it’s awesome. 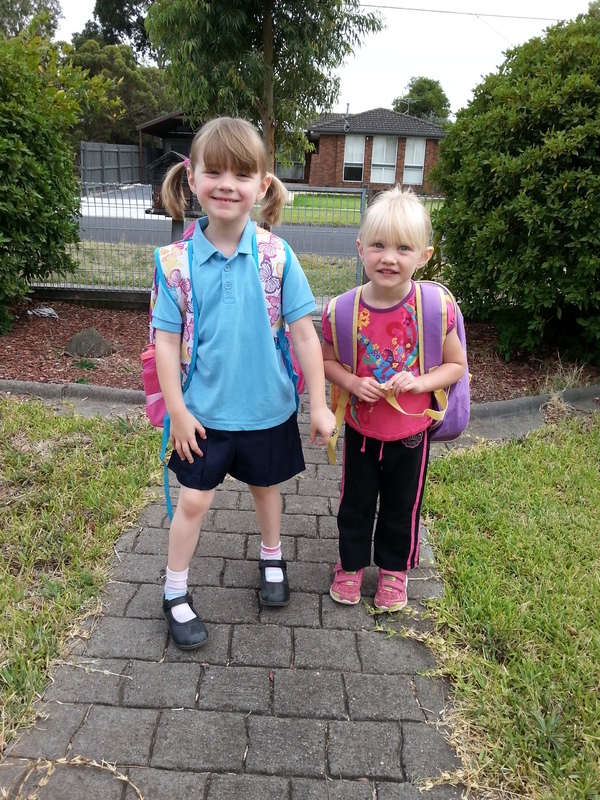 About a month ago, Elspeth started school and Evelyn started kindergarten. Evelyn spent last year sitting in on classes at kindergarten with her big sister, so she’s an old hand at this. Her teacher describes her as “perfect” and “a model student”. No surprises there, she’s a sweet and obliging little person when she wants to be! She’s very happy and having a great time. I was worried about Elspeth; she tooks months to settle into kindergarten last year and I don’t think she was ever really happy there. I anticipated similar problems with beginning school. However, with the help of some people in her class who she knew from kindergarten, and a fantastic teacher, she’s actually doing really well. I think the tighter structure of school suits her, she’s gaining confidence and doing really well. I knew she could read pretty well, but she’s further ahead than I thought, and she’s found it in herself to stand up and read books aloud to her class, so I’m very proud. 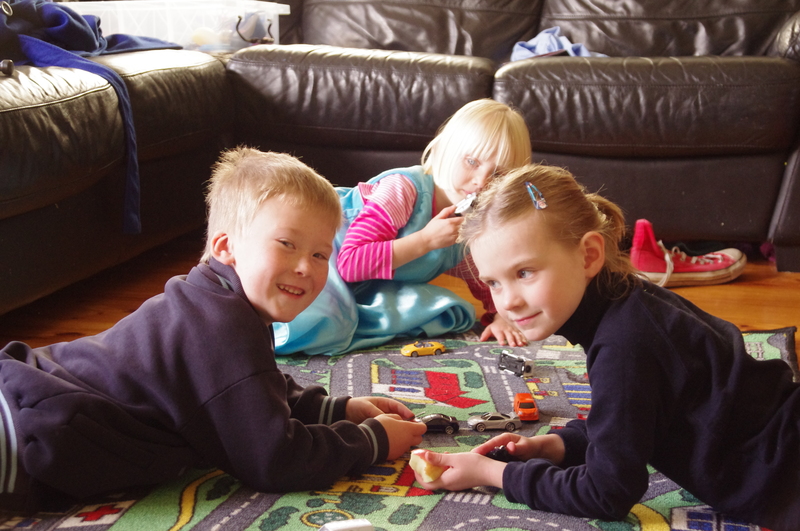 Of course, all these new activities result in tired kids, which often means grumpy kids, but I think I can put up with that! I’m really pleased with both of them. Wednesday mornings are tough. 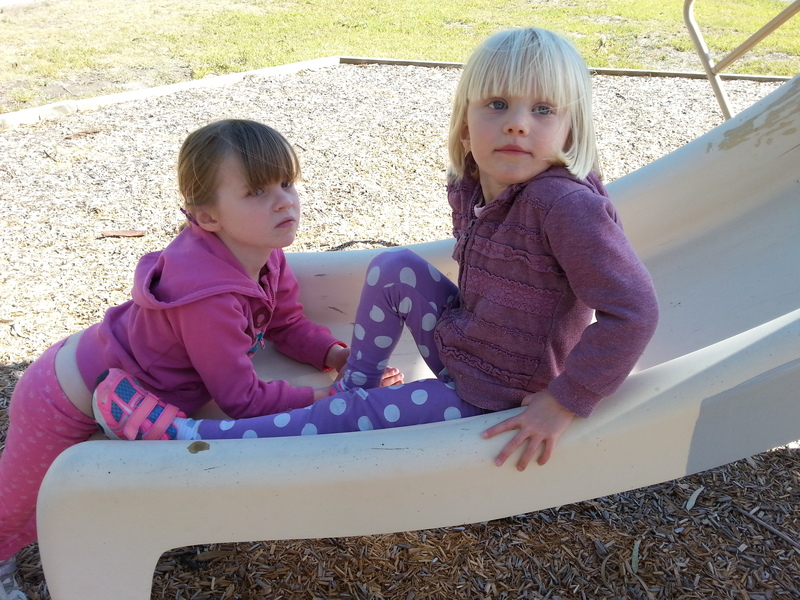 We’ve had four fairly restful days, and suddenly Elspeth’s back at kindergarten starting at 8.15am. Early! Yikes. Evelyn didn’t want to get up this morning, not that I blame her, so I had to pull her blankets off and let the cold wake her. She bore it well, and was cheerful throughout preparations, the walk to kinder, and shopping immediately afterwards. When we got home, though, she jammed her finger in the front door as she closed it. The grumps seemed to remind her of the tiredness, and it wasn’t long before she passed out on the couch! I wanted to put together a list of the words that Evelyn mispronounces cutely before she grows out of it!